FEMALE TROUBLE: Sadesper Record- A Sort of Sound Track for U.F.O. 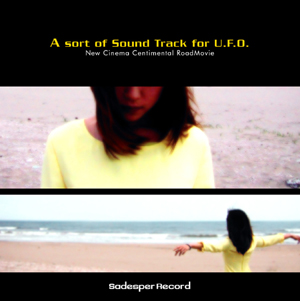 Sadesper Record is a two-person group involving Narasaki of Coaltar of the Deepers (who goes under the alias, Goro Watari, on this album) and Oshima Watchma (WATCHMAN) who has played with groups such as Melt Banana. The CD actually is technically a soundtrack for the movie U.F.O., directed by YU-ICHI SUKIGARA. The video for "Siesta" is meant to be a kind of trailer for said movie. If you've heard Coaltar of the Deepers before, that may gave you a brief indication of what to expect. A nice mix of shoegaze, grind, electronica and pop. Although the genre clash may be relatively close to what Coaltar does, the sound here is quite distinct from that band. Songs such as "Lose Your Sight" is a blissful shoegaze piece with distinctivly J-pop vocals. Think something like Coaltar of the Deepers meets Hatsune Miku. The other tracks sound more "soundtrack-like", with many brief instrumentals that give one the image of running through a dark, industrial city, or drifting away on a soft cloud. The stand-out piece, "Siesta," sounds like what it would be like if aliens abducted Kevin Shields to write a 90's house song. A bit too songy to be called a movie soundtrack, but sometimes too dense to stand out as a complete album. Altogether, this is a very brief, but fun record. I'll post their full-length soon. Hi and thanks. Looks like I'll be back to visit you and your friends. Who is the singer for Lose My Sight? Her voice is so pretty! Hi ! thank you so much for sharing this ! !